The model type JVR-FF is a high production, two DC voltage step fuseless diode rectifier system designed to obtain maximum production performance form material lifting magnets. The rectifier applies a “high" DC voltage to minimize the magnet charge time and the automatically drops the voltage back to a “low”, safe carry voltage to maximize magnet lifting efficiency, minimize the magnet charge time operation cycle and reduce magnet heating. 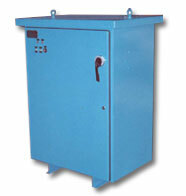 The system includes redundant protective features to prevent locking in the high voltage mode. An evaluation of magnet to be operated must be made for proper “high” and “low” voltages and the time function the unit is to operate within the “higher” voltage operating mode.